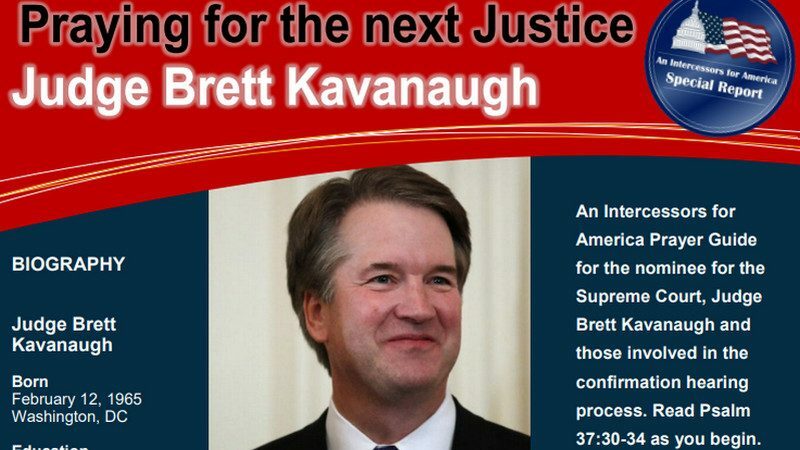 Image from the front page of Intercessors for America's guide to praying for Supreme Court nominee Brett Kavanaugh. Intercessors for America seeks God’s will for the nation through prayer and fasting. We pray for God’s choice to fill the vacancy on the Supreme Court of the United States. Based on Ephesians 2:10, we believe that before time existed, God determined who He wanted to serve our nation at this time in this way. We believe this person has been prepared in the natural and anointed in the supernatural to see God’s “kingdom come on earth as it is in heaven.” Through the Church, the manifold wisdom of God is made known to the rulers and authorities at work today. (Ephesians 3:10). This is the role of intercessors. This is why and how we pray for the nation. Many organizations and Christian leaders that I respect have endorsed Judge Kavanaugh for very sound reasons: He is a textualist and originalist; he is strong on the Second Amendment, administrative law, and religious liberty; he is an intellectual leader as a jurist. A few Christian leaders that I respect have expressed concern for his appointment: he is part of the establishment; he may be unwilling to reverse Roe v. Wade; prophecies have indicated that he may have a spirit of Absalom, a spirit that would usurp the ways of God. We desire to hear from the Lord in this manner, as we always do. As we listen to the Spirit in our own hearts and consider prophetic words, we need to test and verify every “word” we receive. IFA previously distributed a prayer guide on getting judges who “fear God” and will uphold the “Creator’s laws” and a guide to electing “godly” candidates in the 2018 midterm elections, which calls on activists not only to pray but to volunteer in election campaigns.